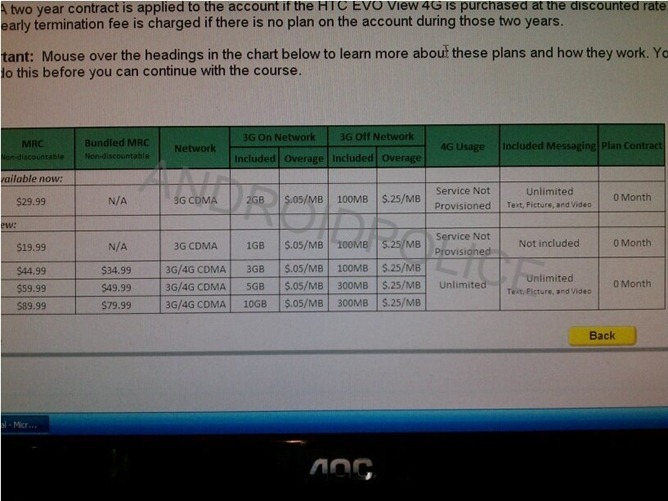 Since the upcoming HTC EVO View 4G will be Sprint's first WiMAX-capable tablet, the Now Network decided to tweak its tablet plans a bit. The baseline price is quite similar to the current tablet plan pricing: 1GB for $20, 3GB for $45, and 5GB for $60. It does, however, include a few new options, namely a new 10GB plan for $90 a month and the addition of unlimited 4G data for a 3GB plan or higher. If you notice, there are two sets of prices there - MRC and Bundled MRC. The latter is a special price point for existing Sprint customers with qualifying unlimited smartphone plans. There's no word when these plans will go into effect, but I would guess that it will happen around the same time that the View 4G launches - on June 24th.